Therefore, it’s safe to say that we are feeling the effects of climate change, and that includes harsh weather extremes on both sides of the spectrum. So, even though a large portion of the globe is currently bundling up to cope with deep freezes, we can expect comparatively sweltering temperatures by the time summer rolls around. This means more rain, and more flooding—of crops, homes, businesses and cityscapes where the water has nowhere to flow and evaporate. That said, some have turned to a previously demonized rodent for salvation from these impending floods. That’s right. 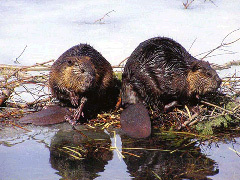 Beavers, and their intrinsic propensity for dam-building, may just be the answer to preventing irreparable flood damage. Why were beavers so scorned in the past? Because these bushy-tailed creatures often build dams wherever they damn well please whether it’s in the middle of a road or in someone’s backyard. The dams would re-route water and actually cause small floods. To conclude, I’d like to borrow and rework an old adage: If you let them come, they will build it. Posted on January 24th under Global Ecology.